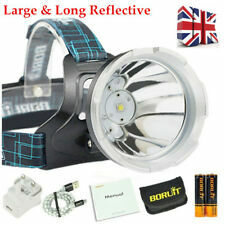 UK Boruit B10 12000LM XM-L2 Micro Rechargeable Headlamp Head Light Torch Lamp CE. 1ST Generation RJ5000 classic hand free lamp light. Suitable for Flashlight Torch. Hands-free, easy to adjust & place on head. make life easier and safer ,great gift for elder too! Light is very evenly spread in a flood pattern, suitable for Fishing. Professional Flashlight. High Quality Flashlight. High Brightness Flashlight. Scuba Diving Flashlight. LED Headlamp. Scuba Diving Headlamp. 1 LED headlamp. Zoomable Headlamp. BORUiT RJ-3001 3*LED Headlight 5000lumen Rechargeable Head Torch For Outdoor Work Description: Brand:BORUiT Model:RJ-3001 Materials：ABS Aluminium alloy Lighting Souce：1PC L2 2PCS R2 Color LED Luminance：5000lumen Color of the light: White Lighting gears：Middle Lighting--Two sides lighting--Three lights--Three light Strobe lighting at the same time--Three lights Flashing Battery type：2x 18650 rechargable battery Charging type：MICRO USB Charging time：4-7Hours Working time：6-20Hours Waterproof：IPX5 Illuminating distance：400M Weight：195G Package size：12*11*10CM Certificate：CE ROHS FCC Features: High Power LED Warning Light Gear switch 3 * LED Lamp Breathable headhand Charging protection USB Charge IP*4 Waterproof. BORUiT RJ-3000 3*LED Headlight 3000lumen Rechargeable Head Torch For Outdoor Work Description: Brand:BORUiT Model:RJ-3000 Materials：ABS Aluminium alloy Lighting Souce：1PC L2 2PCS R2 Color LED Luminance：3000lumen Lighting gears：Middle Lighting--Two sides lighting--Three lights lighting at the same time--Three lights Flashing Battery type：2x 18650 rechargable battery Charging type：MICRO USB Charging time：4-7Hours Working time：6-20Hours Waterproof：IPX5 Illuminating distance：400M Weight：195G Package size：12*11*10CM Certificate：CE ROHS FCC Features: High Power LED Warning Light Gear switch 3 * LED Lamp Breathable headhand Charging protection USB Charge IP*4 Waterproof Main light: white light/strong light/long shot Auxiliary light: soft light without hurting the eyes. High Brightness Flashlight. Professional Flashlight. High Quality Flashlight. Scuba Diving Flashlight. LED Headlamp. LED Flashlight. Scuba Diving Headlamp. Super Bright Headlamp. 3x CREE XM-L T6. Boruit RJ-3000 3T6 Headlamp. 1x 3T6 headlamp. 1bulb light--->2 bulb light--->all bulb light--->Strobe. Adjustable base is provided for each head lamp, with back and forth inclination. 3、SOS whistle. Micro USB Headlamp. universal charging port. B17 Headlamp 1xBORUIT XM-L2 LED Headlamp. LED Model: XM-L2 LED (White light). 1st mode: 1 LED Light. 2nd mode:2 LED Light. Description: Brand:BORUiT Model: B10 Materials：ABS Aluminium alloy Lighting Souce：1PCS L2 LED Bulbs Luminance：1200lumen Lighting Mode： High light- Low light -Strobe Battery type：2x 18650 rechargable battery(not include) Charging type：MICRO USB USB output：USB2.0 5V 1A Charging time：4-7Hours Working time：6-20Hours Waterproof：IPX5 Illuminating distance：500M Weight：202G Package size：17*12.3*8.5CM Certificate：CE ROHS FCC Features: High Power LED Warning Light Breathable headhand Charging protection USB Charge USB Output: Can charge for Mobile/Tablet IPX5 Waterproof Main light: white light/strong light/long shot Auxiliary light: soft light without hurting the eyes Lamp head angle adjustable: the lamp head angle can be adjustable from 0-90degree. Life waterproof: IPX5 waterproof rating,. One button switch : 1x Cree XM-L T6/ 2x Cree R5/ 3x Cree/ Flashing. Model of LED: 3x CREE XM-L T6 2x XPG-R5 LED. CREE LED Headlamp. Adjustable base is provided for each head lamp, with back and forth inclination. Modle:BORUiT B9. BORUiT 18650 Battery 1.3 switch modes:First Mode:XP-G2 (high bright)/Secod Mode:XP-G2 (low light)/Third Mode:XP-G2 (strobe). PWM LED Converter. With SOS Alarm function. LED Model: XP-G2 LED (White light). Model RJ3000 Zoomable hunting headlamp Golden. 1x 3LED Headlamp. Bulb Type XM-L2 2R2 LED. Switch mode 1 Middle Light,2 Side Light,3 All Light,Strobe. Safe light CE / FCC / CCC / EMC Certified. Input :AC90-264v. BORUiT B10 5000LM XM-L2 Micro Rechargeable Headlamp Head Light Torch Lamp CE Description: Brand:BORUiT Model:RJ-B10 Materials：ABS Aluminium alloy Lighting Souce：1PCS L2 LED Bulbs Luminance：5000lumen Color of the light: White Lighting gears：Strong lighting--Weak lighting--Strobe lighting at the same time--Three lights Flashing Battery type：2x 18650 rechargable battery(not include) Charging type：MICRO USB Input: 5V 1A Charging time：4-7Hours Working time：6-12Hours Waterproof：IPX5 Illuminating distance：500M Weight：202G Package size：17*12.3*8.5CM Certificate：CE ROHS FCC Features: High Power LED Warning Light Gear switch LED Lamp Breathable headhand Charging protection USB Charge IPX5 Waterproof Main light: white light/strong light/long shot Auxiliary light: soft light without hurting the eye. T6 Zoomable Headlamp. 1x Blue 6000LM XML T6 LED Zoomable HeadLamp. Model of Battery required: 2x 18650 3.7v. 2 X 18650 3.7V 4000mAh Batteries. Model of LED: XM-L T6. Adjustable base is provided for each head lamp, with back and forth inclination. LED Bulbs: XML L2. Material: Aluminum Alloy Head Lamp Elasticity Head Band. ★.3 LIGHTING MODES. High bright-Low light-Strobe, More mode are available. Do not shine directly into your eyes in case of any possible harm result by the intense light. Lighting gears：Middle Lighting--Two sides lighting--Three lights--Three light Strobe. Waterproof：IPX5. Lighting Souce：1PC L2 2PCS R2 Color LED. Lamp head angle adjustable: the lamp head angle can be adjustable from 0. Suitable for Flashlight Torch. Hands-free, easy to adjust & place on head. make life easier and safer ,great gift for elder too! Light is very evenly spread in a flood pattern, suitable for Fishing. Description: Brand: BORUiT Model: B23 Materials：ABS Aluminium alloy Lighting Souce：1PCS XPE 13PCS 3030 LED Bulbs Luminance：5000lumen Color of the light: White/RED Battery type：2x 18650 rechargable battery(not included) Charging type：MICRO USB Waterproof：IPX6 Illuminating distance：500M Weight：about 150G Package size：12*11*10CM Certificate：CE ROHS FCC RED Lighting: Press the left switch 2 seconds for red lighting(the below one of the middle lights): Light modes: Strong-Weak-Flash-Regularly flash. White Lighting Press the right switch 2 seconds for white lighting: Lighting modes: Strong-Middle-Weak lighting(the upper one of the middle lights) Strong lighting-Weak lighting(the two sides lights) all the wihte lights light at the same time--all the white light flash at the same time. Model of Battery required: 2x 18650 3.7v. 2 X 18650 Rechargable 3.7v 4000mAH batteries. One button switch : 1x XM-L T6 White Strong /1X XM-L T6 White Low/ 2x RED LED. Suitable for Flashlight Torch / Headlamp. Model of LED: 3XLED (T6 2R2). 2 in 1 design, Can be used as headlamp or Power Bank. 1 x RJ-5000 3X LED Headlamp. Adjustable base is provided for each head lamp, with back and forth inclination. The special designed USB cable for the LED lamp light. BORUIT B10 is a High-Brightness headlamp with XM-L2 LED White light sources newly upgraded bassed on Most one LED headlamp,with light cup and the light shine widely,making perfect combination of light cup and lens. 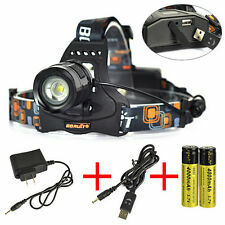 BORUiT 18650 Battery B10 XM-L L2 LED Digital Headlamp ,Deep Cup Wide Range Spotlight ,Anti-reverse connection. It's just a 1-LED Headlamp. C. 2secs long press for fast sos mode. with this headlamp you can find that mode in 2secs. Description: Brand:BORUiT Model:B22 Materials：ABS Aluminium alloy Lighting Souce：1PCS L2 2PCS XPE R2 LED Bulbs Luminance：5000lumen Color of the light: White Lighting gears：Middle Lighting--Two sides lighting--Three lights lighting at the same time--Three lights Flashing Battery type：2x 18650 rechargable battery Charging type：MICRO USB Zoomable: Support Input: 5V 1A Charging time：4-7Hours Working time：6-20Hours Waterproof：IPX5 Illuminating distance：500M Weight：237G Package size：17*12.3*8.5CM Certificate：CE ROHS FCC Features: High Power LED Warning Light Gear switch 3 * LED Lamp Elastic headhand Charging protection USB Charge IPX5 Waterproof Main light: white light/strong light/long shot Auxiliary light: soft light without hurting the eyes Lamp head angle adjustable: the lamp head angle can.